Rocko said don’t be one of those people . . . the ones who say they will never love again. He said when you are ready I will send you your new dog. Dog. Singular. Nothing was said about two dogs. Losing Rocko was a peaceful experience. We had a long life together, a good life. Sure I went through all the usual emotions, wondering if I could have done something different, constantly looking over at his spot to find it empty, but all in all I was ok.
There’s a big responsibility to caring for a senior dog. For Rocko’s last three years, my life revolved around him. I gladly gave up my social life to spend what time we had left by his side. When it is finally over, you feel lost but there is also a feeling of freedom. I could stay up baking biscuits until midnight, I didn’t have to rush home from work, I didn’t have to set the alarm on weekends for medicine. No more worrying all the time about my senior dog. Just as he was free of all his aches and pains, so was I.
I planted new gardens around the back yard where Rocko used to walk and did some painting in the house. Life went on, filling time with odds and ends. I had no intention of adopting another dog in the near future. I still had a credit card bill from Rocko’s final months. I could use the extra time to work harder on expanding Rocko’s Rewards. I had a list of things to get done before I could let another life into our home. Rocko would tell you that I over-analyze everything. Rocko would also say that sometimes I need to stop and take a leap of faith. I made it 2 1/2 months. Then Rocko stepped in. I was baking biscuits one day. Baking biscuits is tranquil and tedious work. I’m alone, the radio is on, I can see the gardens out the window. My mind often wanders while I’m working. I thought . . . maybe it’s time to consider a new dog. My next thought was two dogs. Two dogs would be nice. Maybe I could find two dogs who were related. 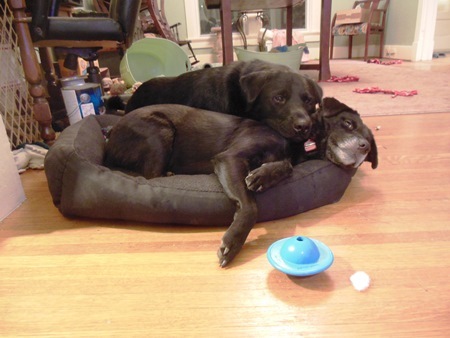 Two black dogs. And of course they would have to be chows – it was the chow in Rocko that I loved so much. I finished up my baking and sat down with my laptop. I always knew if I adopted again it would be a dog that wasn’t already rescued, one who was truly in danger. LMAS, our local animal control, would be where I would find my next dog. I went to the page of intakes and put in the search word chow . . . There they were. 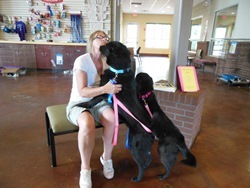 A 2 year old male and 3 year old female, picked up together as strays on May 28, 2013. 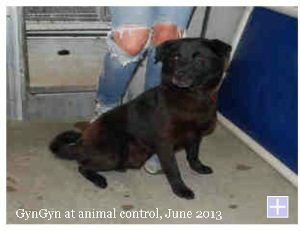 Black dogs, probably related, listed as chow mix. Our vet says the timing is right and a later session with our favorite animal communicator confirmed that they are mother and son. There was no turning back. I went to animal control and walked through the rows of barking dogs, tears streaming down my face because I couldn’t save them all. I found them in their kennels and while at first look I didn’t see a whole lot of chow, I could not say I’m sorry, you weren’t what I was looking for and I’ll let your life end here. I looked into their eyes and made them a promise. I will be back for you and we will be a family. 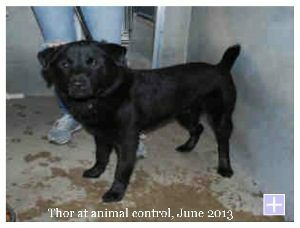 A week later, after applications and reference checks plus a spay and neuter, it was time for Thor & GynGyn to come home. We were one big happy family . . .
What on earth was I thinking, going from an 18 year old dog to two young ones? I thought 2 and 3 meant they would be somewhat grown up and calm but these two were anything but calm. They were insane! They ate the couch. And ate it some more. I started calling it the-couch-that-deserved-to-die. 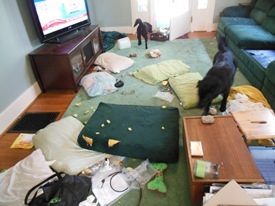 I’m not sure what that couch was doing to them while I was gone but it was the focus of all their energy. They fought under the bed every night – all night. Thor bonded to me immediately and was anxious when I was out of his sight. GynGyn was a dominant female who wanted to rule the house. For the first time I really and truly understood why people adopt dogs and return them. But I wasn’t that person. I WAS the person who wondered every day what Rocko was thinking when he got me into all this mess. I enlisted the help of a trainer who worked with positive reinforcement. I quickly learned to get control of our household. Those first few weeks were hard. Thor & GynGyn had to sit before I would talk to them or pet them. It didn’t take long for them to enjoy sitting and being praised for doing good things. 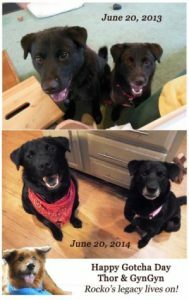 Over the next few months they transformed from monsters into (mostly) very good dogs. It took a long time for me to realize that as they were transforming into a new life, so was I. I had two young high energy dogs so we started taking a walk every day. Thor & GynGyn are friendly in a way that Rocko never was. Every day we meet new people and see new things. We stop and visit neighbors I had only waved to in the past. We see old friends on the corner and stop to chat. Thor & GynGyn go to the farmers market every week and have their own group of friends who stop by to visit. And I finally understood why Rocko sent them to me. 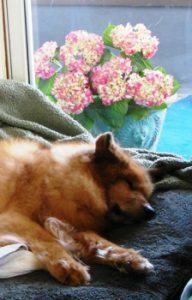 In the last few years of his life, I took care of him and he appreciated it, but he also knew that I willingly had given up a big part of my life for him. Rocko knew that if he didn’t intervene I would stay alone. He sent me Thor & GynGyn to bring me back out into the world. Thank you Rocko. You’ve sent me on a new journey and given me a new life. Not the life we had together but something different. Something I didn’t know I needed until you gave it to me. Welcome to the family Thor & GynGyn. The floor is covered with toys, the house is a mess and I have to lock up the biscuits when I leave but you bring joy to our home and make me smile every day. We have still have our share of crazy but we more than make up for it with love. If you haven’t read Rocko’s story, check it out here!